This Product Order Supplies the Following BOM (Less Foundation and Installation) in accordance for Use as a Bracketed 50 Foot ROHN 45G Tower with EPA's (Effective Projected Area) Ratings for 70, 80 or 90 MPH (No Ice). Refer to Larger Image, Brochure or Footer Links at the Bottom of the Page below for Ice Loading and EPA Information. This 45G Tower is to be used in a Wall Bracketed Configuration according to Use and Foundation Specifications in the ROHN Catalog. This Height Configuration relies on a SB45G Imbeded in a Concrete Foundation Specified by Engineering. As a Wall Bracketed-Properly Mounted Structure, a 70, 80 or 90 MPH rated 45G Tower can rise to a maximum of 100 feet. Consult ROHN 45G Catalog Links of the Footer Section at Bottom of Page for more ROHN 45G Tower Configuration, Foundation and Grounding Detail Information. Note: Bracketed Towers are Specifically useful when your project calls for a Tower to rise above the building's height, but for various asthetic and Weight Bearing Load considerations, cannot construct the tower upon the roof itself. The Bracket Tower Scenario relies on the Building's Load Bearing Outside Wall, using a portion of it to bolt on the base and first bracket, establishing a secure cantilever, whereupon the tower can rise as a Self-Supporting Structure above the building's roof without unsightly guy wires or a ground presence below. Self-Supporting Towers are limited in Height due to the nature of Antenna and Ice loads versus the Cantilever Nature Of Wind against them, offset by the weight of the Foundation and the cohesive of the soil to counter Tower tipover, as well as the strength of the tower members to withstand these Forces against them. ROHN Tower Kits are designed based on assumptions made regarding Windspeed, EPA (Antenna Load), Height, Standard Soil Conditions, Surrounding Environment and Duty. The Pre-packaged Kits contain the parts called for based on this Stock Design. 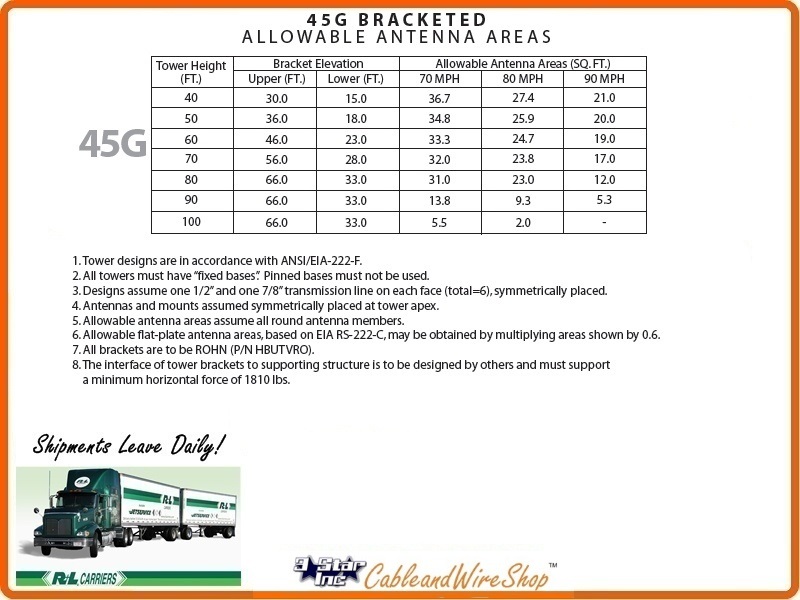 The Stock Design of these Kits does not account for the Variations of Historic Windspeed, Number of Antenna(e) Loading at Specific Height(s), Soil Engineering recommendations, Adjacent Structures, Communications Purpose, or Geo-Political Rules, Laws and Codes That will be Applicable to Your Project. It is Recommended that you take the time to engage an local Engineer that has the expertise and available Information necessary to evaluate the Stock design for Applicability, and/or find the Tower Quote Data Sheet Form by clicking the link that appears on the Footer of this Page Below. *Per Rev G requirements, any structure greater than 10 ft requires a climber safety device. The 45G Bracketed Tower can be installed adjacent to buildings using a bracket to secure the tower in one or two locations along the height of the structure. 1. Tower designs are in accordance with ANSI/EIA-222-F.
2. All towers must have "fixed" bases. Pinned bases may not be used. 4. Antennas and mounts assumed symmetrically placed at tower apex. 5. Allowable antenna areas assume all round antenna members. 6. Allowable flat-plate antenna areas, based on EIA RS-222-C, may be obtained by multiplying areas shown by 0.6. 8. The interface of tower brackets to supporting structure is to be designed by others and must support a minimum horizontal force of 1810 lbs. o Completely hot-dip galvanized after fabrication to provide absolute corrosion protection. o Cross bracing is formed by a continuous solid rod bracing in a zig-zag pattern for strength. o Pre-engineered loading charts meet varying individual specs and site conditions. o Typical uses include small dishes, broadband, security and two-way communication. This ROHN G-Series Bracketed Towers Guide will answer many questions you may have on this Product Line. For more detailed information and Specification Sheets covering many aspects of Various Parts, Accessories and Installation Scenarios... Please refer to the "ROHN 45G Tower" Link appearing in the Footer of this Page Below!